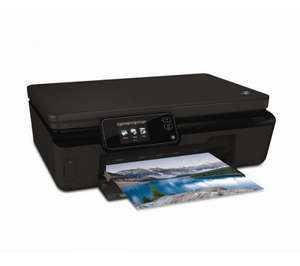 The HP Photosmart 5524 All-in-One Inkjet Printer brings outstanding image and document quality and dynamic multi-functionality to your home or office. With this incredible HP Photosmart All-in-One Printer you'll be able to wirelessly connect even when you're out and about, printing images and documents up to A4 size. This can be incredibly useful for the mobile businessperson, designer and photographer when pictures and documents need to be quickly created for remote appraisal or dispatch. You can even scan images directly to email thanks to the brilliant WiFi connection. With AirPrint and ePrint compatibility, you can connect and print from your smartphone or tablet for a more seamless way of working. Since the HP 5525 Photosmart Printer has a memory card facility and a big 6.74 cm graphical touchscreen with intuitive controls, you don't even need to connect to a computer to get your printing done. This Multifunctional Printer connects simply via USB for smooth, easy setup and use. The printer also houses excellent scanning and copying functions to really round out your professional output, giving you true cross-platform imaging flexibility. The 5525 Photosmart features automatic two-sided printing so you can save on paper and expenditure, as well as being a little more Eco-friendly. Combined with Mac and PC compatibility, it's this kind of flexibility that makes this Wireless Printer a truly formidable office tool. Able to output up to 2800 x 1200 dpi resolution, you can generate print lab-quality photos and everyday documents with individual, purpose-specific inks. Documents and images will look unbelievably crisp and colourful, and you'll also save more with high-capacity cartridges for frequent printing. To make sure that you can get to work straight away, the HP 5525 Photosmart Printer comes with an extra HP 364 combo pack of ink with black, cyan, magenta and yellow cartridges. Currys also have a Canon Pixma MG5250 for £69.99. This gets 4.5 or 5 star reviews, depending upon where you look. Stinkyink does a bulk pack of all inks for £24. Must better long term value than the HP. Not sure why this is so cold as the price of the ink, as a combo pack of 4, is only £19.21 at Amazon. The 5 cartridges on the Canon add to the running cost but the Canon print quality may be worth the little extra running cost.